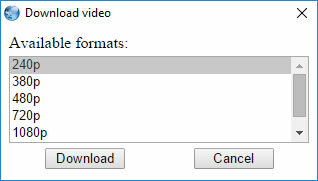 Click that button to initiate the video download process. If there is a single format available, you will get a download confirmation dialog to start the video downloading proess with the turbo-charged download manager immediately. If multiple formats are available, you will be shown a dialog for you to choose between multiple resolutions. Select the format you want and click the Download button to start downloading the video using turbocharged download manager. If you are not yet an existing Slimjet web browser user, Download Slimjet for FREE Now to start enjoying the "Download dailymotion Video" feature and a lot more other powerful features available in Slimjet.